Jags Tasting 101 is proud to announce the next in our successful food tasting series: Sushi, Sake + Beer. Join us at 6:30 p.m. on Thursday, August 31, 2017 for a delicious five-course meal expertly paired with Sake and Japanese beer. The dinner will include the history of sake and Japanese beers from industry professionals, as well as discussion and tasting notes. 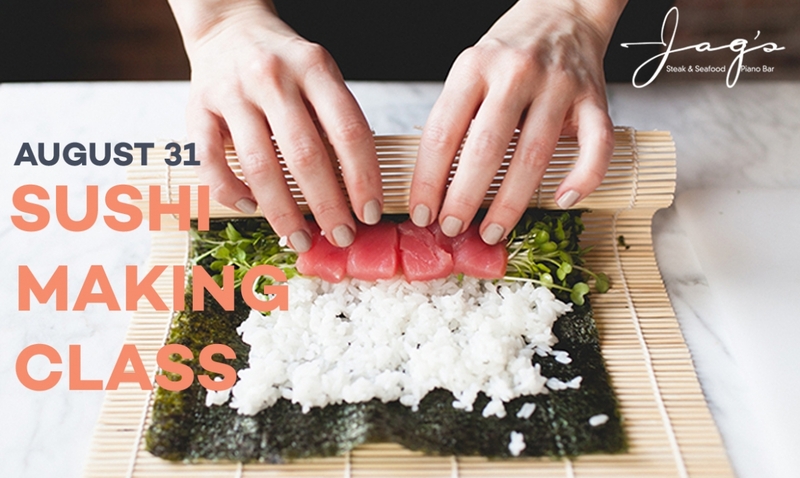 Guests will learn the art of making sushi rolls and will have the opportunity to create their own Jaguar sushi roll: tempura shrimp, king crab, cream cheese, avocado and spicy aioli paired with Sho Chiku Bai’s Mio Sparkling Sake. Four additional courses will be served throughout the night including an Asian Pear Salad: sake poached Asian pear, bok choy, mustard greens, candied ginger, smoked salmon, fried cashews, miso kaffir lime vinaigrette paired with Sho Chiku Bai’s Nigori Unfiltered Sake. Reservations are $65 all inclusive and are required. To reserve your seat, visit www.jags.tocktix.com before the event sells out.